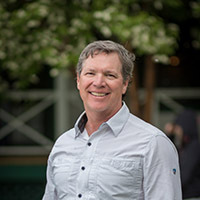 Tim began working in ranch real estate in 1999. Born and raised in SE Iowa, Tim moved to Bozeman, Montana in 1991 enamored by the landscape of the Northern Rockies. An avid outdoorsman, he can often be found fly-fishing, bow hunting, alpine skiing, pursuing upland birds and waterfowl with his bird dogs whom are also often companions on ranch tours. Tim holds brokerage licenses in Montana and Wyoming and although the Greater Yellowstone Region is effectively his “backyard”, he equally enjoys the huge expanse of prairie and smaller mountain ranges that make this part of the west so unique. Tim is quite familiar with the region and well versed on how these ranches operate and how that may dovetail to a new owners needs and desires. Particularly, Tim has a strong base knowledge of aquatic development and wildlife management which he enjoys sharing with clients. He is a skilled photographer which naturally is supported in his career. Tim and his family continue to live in Bozeman and enjoy every aspect of the mountain community. Antelope Butte Ranch is a 1,260± deeded acre retreat located west of the desirable community of Big Timber, Montana on the divide between the Yellowstone and Boulder River valleys. The lands are a combination of rolling range interspersed by grassy meadows, pine covered hills, seasonal creeks, springs and steep coulees. The views are spectacular, taking in five mountain ranges dominated by Sheep Mountain and the towering Crazy Mountains to the north, which contrasts against an abyss of prairie that seems to extend infinitely to the east. Two stylish but easily maintained custom-designed homes were harmoniously constructed, creating a main residence with a second residence for guests and extended family which are capable of sleeping 12-14 people. The ranch has a small summer grazing operation and is also home to a wide variety of wildlife including deer, antelope and the occasional elk. Antelope Butte Ranch is an ideal seasonal retreat with easy access to the larger cities of Bozeman, Livingston and Billings, Montana.